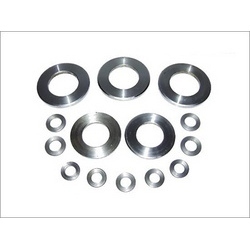 Manufacturer of a wide range of products which include machined washers. Machined Washers are manufactured on Lathe for accurate and precision requirement of plain washers in I.D., O.D. & Thickness which is not possible in punched washers. Special Washers can be manufactured as per I.D., O.D. & thickness requirement, as per drawing and sample provided by client. Can be manufactured according to standards and specifications. Looking for Machined Washers ?